The Gorna Breznitsa monastery is situated above the village of the same name and 5km northwest of the town of Kresna. 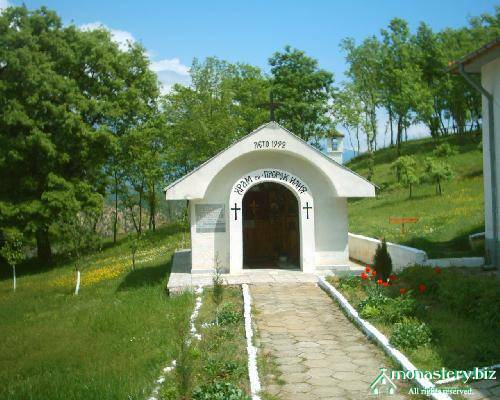 It is relatively easy to reach the monastery and its visit can be a nice stop during a trip in southwestern Bulgaria or a calm weekend in the Pirin mountain. The monastery complex offers a magnificent view to the village beneath, and the Malashevtsi and Pirin mountains with Pirin’s peak Vihren standing out in the distance. The Gorna Breznitsa monastery, named St Prophet Iliya, is one of the new Bulgarian monasteries as it was established in 1992. It consists of a monks’ dwelling part, a small church and a bell-tower. Construction works on a new church were quite advanced at the time of our visit and the new building was expected to be finished in early May, 2004. The monastery’s yard keeps remains of a nunnery, ruined during the Ottoman rule and abandoned by its nuns which fled to present-day Macedonia. A few meters away from the monks’ dwellings, one can see a holy spring, where long ago, a shepherd found the icon of St. Iliya, shown in the church and considered to be miraculous by the monks. In the church, visitors can also see remains of ancient Thracian earthware, which were come across during the construction of the temple. The vessels are believed to date back to the middle of the 3rd century AC.